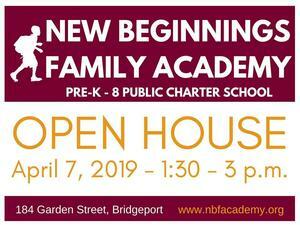 New Beginnings Family Academy will hold an Open House on Sunday, April 7 from 1:30 to 3 p.m.
Teachers and administrators will be available to meet parents and prospective students and answer questions. Tours of the facility will also be provided for interested parents and children. 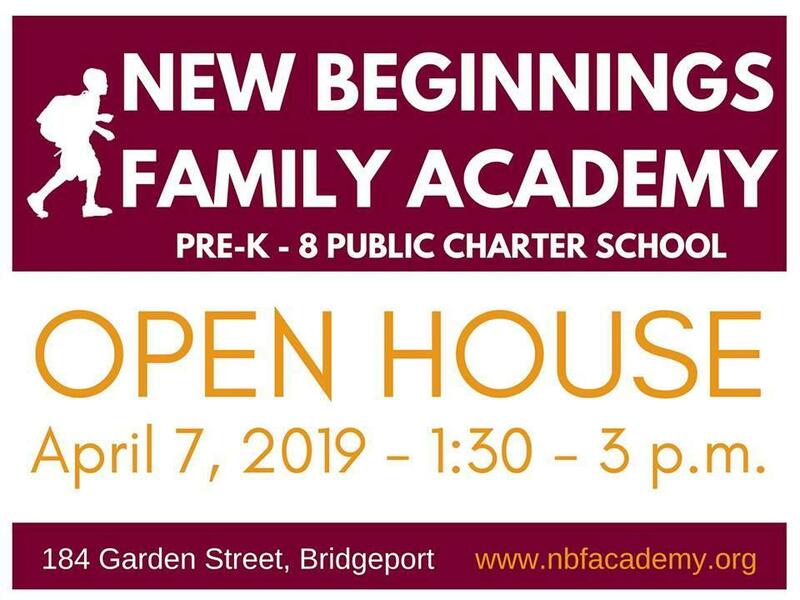 Come learn how our public-charter school – open to enrollment for Pre-k3 to eighth-grade students in Connecticut – implements a progressive education model with emotionally responsive practice. As Bridgeport’s only progressive education public charter school, NBFA offers project-based learning, enrichment centers, hands-on projects, and frequent field trips. NBFA combines engaging academics with experience-based learning, helping students to develop essential social, emotional and critical-thinking skills. NBFA has an educator to student ratio of 10:1, with an average class size of 20. To submit an enrollment application online visit our website at www.nbacademy.org. NBFA partners with after-school providers including the Cardinal Sheehan Center, the Boys & Girls Club & The McGivney Center for as little as $1 a day. Free transportation to the centers provided. New Beginnings Family Academy (NBFA) is a tuition-free public charter school for students in grades Pre-K through 8th, located in Bridgeport, CT. Our mission is to provide students with a meaningful, high-quality education through experience-based learning that helps them develop essential social, emotional and critical-thinking skills. This gives all children the necessary foundation to achieve their full potential at every stage of life. To accomplish our goal of preparing students for life-long success, we work with experts from Bank Street College of Education to implement a progressive education model with emotionally responsive practice. This model attends to the whole child, not just academics, and focuses on developing collaborative, socially responsible leaders by organically weaving ethics and character-building into daily instruction in small-class settings. Our student-focused approach brings out the best in each child by getting to know them individually, encouraging curiosity, and fostering their personal interests. All NBFA students are selected through a blind lottery, and there are no admissions criteria.